If you're watching a David Lynch movie and you find that you don't understand everything that is (or any of) happening, that's completely understandable. If you are watching a foreign film and it doesn't make total sense, one would be able to comprehend why. But, if you are watching a mainstream, bubble-gum movie and have difficulty following the story, then there may be a problem. Either there is something wrong with you or the movie doesn't provide enough information to completely add up. With Insurgent, the second film in the Divergent series, I'm thinking that it's the latter. Divergent introduced us to Tris Prior (Shailene Woodley), a young woman who lives in a future where society has been split into various "Factions" (basically careers). When teens come of age, they are to choose which "Faction" to join, a decision which is mostly based on the results of a test. 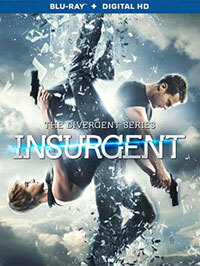 However, Tris possesses the traits of all five factions, which makes her "Divergent". After joining the "Dauntless", who are basically the police, Tris meets and falls for Four (Theo James). Together, the two discover that Janine (Kate Winslet), has hatched a plot to wipe out some of the factions. As Divergent ended, Tris, Four and some others appeared to be leaving their walled city. In reality, they were headed for Amity, the farming community. They stay there until Jeanine's soldiers invade, at which time they head back into the city, where they find shelter with the Factionless. When Janine threatens to kill everyone, Tris decides to take matters in her own hands. Little does she know that Janine has special plans for the city's most powerful "Divergent". If you've read my review for Divergent, then you know that I came away from that film with two main impressions. First, it was a ripoff of every other popular YA novel/movie (amongst other sci-fi stalwarts), and secondly, that it didn't make any sense whatsoever. If everyone has the ability to choose their faction, aren't they all "Divergent"? And who thought that placing everyone into specific groups would bring about peace? Doesn't a caste system only create animosity? I know that it's nitpicking, but the fact that the entire structure on which the movie was built was ridiculous kept me from fully engaging in the film. I can't say that I had high hopes for Insurgent, but I was hoping that the movie would perhaps clear up some of these things. But, no, things only get more and more convoluted here. Not only is Tris still the only true "Divergent" (we learns that others can be slightly "Divergent"), it now appears that being a "Divergent" gives her special powers. Tris and Four move through the city meeting new people and fighting with some of them, but we rarely get any explanation as to what is going on. Janine clearly has the force to kill Tris, but she suddenly needs her (isn't that convenient), so Janine's forces only try to kill everyone around Tris. Janine's brilliant plan involves a mysterious box which she is determined to open, as she thinks that it will give her the upper-hand. Where did she get this information? And what kind of name for a villain is Janine? Janine? Isn't she a friend of my mom? As with Divergent, technically, Insurgent is a solid movie. Director Robert Schwentke, who has made some good movies, brings a great visual flair to the virtual reality sequences, the first of which is very impressive. (I don't know if/how this scene is described in the book, but it's well done here and probably looked great on the big-screen.) However, the talent in front of the camera doesn't fare as well. For some reason, I've seen nearly every feature film in which Shailene Woodley has appeared, and she simply doesn't impress me. She doesn't emote very well and I find her to be very stiff. The same goes for Theo James, so when the two get together...whatever the opposite of sparks flying is happens. Winslet, who is typically flawless, doesn't seem to know what to do as the heavy. And Miles Teller, well, he certainly is Miles Teller. I would like to say that Divergent doesn't feel as much like a rip-off as the first film, but that wouldn't be the case, as now that's it's moved passed it's Harry Potter-like beginning, it now feels even more like The Hunger Games, from the scenes in which the characters are forced to hide underground to the battles in the shiny government buildings. I can't even see why young women would turn to Tris as a heroine, as she doesn't have the same family motivation that Katniss does. I suppose it's good that a sci-fi/action film is being targeted to younger viewers, but they deserve a movie with better writing. Perhaps the next film in the series will truly "divert" and bring in a better story. Divergent proves my theory that the light rail is dangerous on Blu-ray Disc courtesy of Lionsgate. The film has been letterboxed at 2.35:1 and the Disc contains an AVC 1080p HD transfer which runs at an average of 25 Mbps. The image is very sharp and clear, showing no notable grain and no defects from the source materials. The colors look good, and the image is never overly dark or bright. The level of detail is excellent and we can make out textures on objects. The depth, even in this 2D version, is great, as the actors are notably separate from the backgrounds. The Disc carries a Dolby TrueHD 7.1 audio track which runs at 48 kHz and an average of 5.5 Mbps. The track provides clear dialogue and sound effects. This is a muscular track in which the action sequences really shine. The stereo and surround effects show good separation and they highlight sounds which move from side-to-side and front-to-back. These effects often show of individual sounds. The subwoofer effects are powerful as well, offering wall-shaking sounds. The Insurgent Blu-ray Disc contains a large array of extra features. We begin with an AUDIO COMMENTARY from Producers Doug Wick and Lucy Fisher. "Insurgent Unlocked: The Ultimate Behind-the-Scenes Access" (116 minutes) is a feature-length making-of featurette which is divided into seven chapters that explore many different facet of the film's production, from locations to production design to stunts to the score. This includes a ton of on-set footage, design concepts, and interviews with the cast and creative team. "From Divergent to Insurgent" (5 minutes) opens with Wick saying "Divergent is an incredibly original book." So, there's that. The piece then looks at how the story and the characters have evolved since the first film. "The Others: Cast and Characters" (4 minutes) examines the new characters who have joined the series in this film. "Anatomy of a Scene: The Train Fight" (4 minutes) takes us on set to see how this interior melee was shot. Miles Teller's annoying character is profiled in "The Peter Hayes Story" (3 minutes). "Diverging: Adapting Insurgent to the Screen" (4 minutes) has author Veronica Roth commenting on the process of having her books made into movies. The "Marketing Gallery" contains a "Sneak Peek", "In-Theater Promotional Making-Of", "HBO First Look", five THEATRICAL TRAILERS, an "Image Gallery", and "Animated Character Portraits".